Since the launch of The Rapidian, exactly three months ago to the day, The Rapidian has been operating in what we’ve been calling “Beta I.” It has been a time to throw everything out there and see what works and what doesn’t. Things, for the most part, have been pretty good, but there has definitely been room for improvement. And you have helped. We have spent the last three months listening to the feedback many of you have provided about how The Rapidian could be improved. How using The Rapidian could be an easier, more enriching experience. Your feedback has brought up many, many issues and we have tried to address them as best we can. We have been actively reorganizing The Rapidian so it makes a little more sense to readers, contributors, and editorial mentors alike. Ron Woldyk, our absolutely amazing web guy, has been hard at work making all of our dreams come true. When we first launched The Rapidian, we thought we had a really ace organizational structure. We had three main categories: News, Opinion and Local life. We had sections such as technology, politics and economy. It quickly became clear that there was quite a bit left to be desired from the way we laid things out. First and foremost, the structure was too rigid. Reporters could only use certain categories for certain kinds of stories, and as a result there was no such thing as “art news” or “political opinion.” These concepts existed, but they weren’t something you could browse within The Rapidian's framework. We've changed that. Now, if you want to read news stories about sports, for example, you can simply click “NEWS” and select “SPORTS” from the drop-down menu to the right. Similarly, if you want to check out a profile of that awesome runner down the block, you can click “LOCAL LIFE” and select “SPORTS” from the drop-down. The same is true for “OPINION.” If you click “ALL,” you can browse all sports-related coverage on The Rapidian on one page. We've added more sections and spruced up existing categories to be more self-explanatory (i.e. : "Crime" is now "Community Safety"). An emphasis on the “really local” has always been a key value of The Rapidian, and one way this manifests is through the Neighborhood Updates map on our front page. We use this map to visualize where The Rapidian’s stories take place. The idea is to better understand how stories relate to one another spatially and find commonalities throughout the city. The city quadrants were divided to mirroring The Rapidian’s four physical news bureaus, set to start coming online in 2010. One thing we noticed pretty immediately though was that the Heartside-Downtown neighborhood was a regular setting for stories. This was particularly awkward; Heartside-Downtown doesn’t fit neatly into any of the quadrants. Is the UICA on the SE side of town? Is the Van Andel Arena in the SW? Technically, they are. But as Grand Rapidians, it is unnatural to categorize any of these places as anything but downtown. Now we have a "fifth quadrant." Starting today, you have the option to select your story setting as the Heartside-Downtown Neighborhood. Many users, particularly our Nonprofit Neighbors, have asked for another way to list events on The Rapidian. Press releases are great and all, but it's easier to plan your week by going to one place on the site where all GR event information have been pooled. 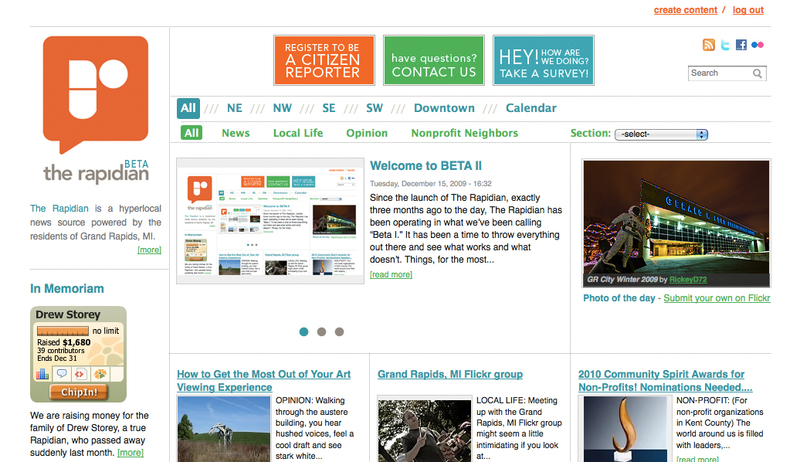 All registered users of The Rapidian (not just reporters and nonprofits) can add events to the site. What’s more, you can also connect events to articles that already exist on the site to provide further context. You can also organize and browse events by categories like Arts and Entertainment, meetings, and volunteer opportunities. Check it out! You may have noticed that every month, we have a story theme. We select a general topic to prompt reporters to think about what they can contribute to The Rapidian and then map the results where possible. The story map usually takes up the biggest spot on the front page as the feature article. While we are encouraged by the response we’ve gotten to story themes, we also think it’s a little selfish to hog all that prime real estate. We really want to feature more of the awesome and timely contributions by Rapidians. From now on, you will be able to cycle through multiple “featured” articles at the top of the front page. There is a little teal dot to indicate which piece in the series you are looking at. You can browse through this spot for monthly story theme maps, editorial updates from staff (like this one), a temporary story pitch bank and featured content from Rapidian community contributors. This one is strictly for contributors. In the past, we had four basic content types: News, Local Life, Opinion and Nonprofit Neighbor. You know them. You might not love them, but you are probably OK with them. We were, too, for the most part. We still like the content types as basic descriptors but have struggled with what to do when an article is categorized as “news” yet might make more sense as “opinion” or “local life,” or any other combination of options. Because of some limitations with Drupal, the web system that TheRapidian is based on, it was difficult to reorganize these articles without deleting them and reposting them under the correct designation. What a pain! Our solution is to offer one type of submission: the "Article." When you go to the "Create content" page, instead of seeing options to create a news, opinion or local life piece, you will only have "article." Once you get to the "create article" page, you can choose whether your piece is a news, opinion or local life piece. This makes it easy for contributors and editorial mentors to freely recategorize the content type. To access this new feature, log in and click on the "Create content" link in the top right corner of the site. You will also notice that adding content is a little differently organized. We hope for the better. One quick caveat: Contributors registered as reporters and new reporters can add news, opinion and local life articles (as well as events), but not nonprofit articles. Nonprofit Neighbors can only add nonprofit articles and events. As a member-powered outlet for the Grand Rapids community, we have known all along that some user contributions may not be appropriate for all ages and sensibilities. In order to handle topics and issues that might be a little more risqué, we have introduced the “mature content disclosure.” We ask all contributors who wish to post something that might be a little “adult-oriented” to fill out the mature content disclosure part of the "Create Article" form with some details as to why you think it might be “mature.” This will put a little flag at the top of the article so that sensitive readers have an idea of what to expect. Our contributors have been very sensitive to this and have asked very important questions about how to create content about their passions without seeming like a paid mouthpiece. We really appreciate this and have created the disclosure statement for contributors to illuminate their connection to the story. It’s OK to be connected to a story in some way as long as you let people know. A lot of people are only in the position to contribute on an issue because of their closeness to it the first place. These changes would not have happened without your feedback. Your suggestions and critique have been critical to the progress we have made with The Rapidian, and will continue to be critical as we move forward. If you have anything to say about the changes we’ve made – or about the project as a whole - I encourage you to fill out the Beta Feedback Survey or to comment on this post. Let us know what works for you and what doesn’t. We are listening. Welcome to BETA II of The Rapidian!